Today is the first day of raya celebration in Malaysia. Even thou I am not celebrating this festive season but still I am enjoying myself...celebrate my raya with my own way.After did my laundry, my brother and I went to Low Yatt Plaza for some window shopping. Actually I went there to look for VK Mobile's phone charger. It is for Azman's brother in-law. I did managed to find the charger but I need the phone itself to make sure it really works with the charger. Since i didnt have the phone so I didnt buy it. That is my first activity in the morning. Then in the afternoon I fetch a friend of mine in STAR LRT Station in Masjid Jamek. He came all the way from Taiping since he works there. He came to KL to fetch his wife and his cute little girl at the LCCT Terminal Airport. So I help him by being his driver for a day. Here is a snap shot I took of my friend with his baby Athira. 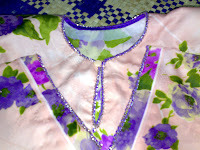 Anyway, yesterday i did some beading on my baju kurung.Here I shows you the image of my beading. It is my first attempts and currently on progress with my other baju kurung. 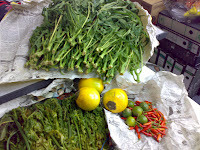 A few days before I received a package contains vegetables from my mom. 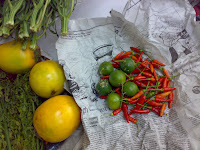 It contains our local terung asam - the yellow fruit (only available in Sarawak), chilies, lime, tapioca leaves and ferns. Thanks a lot mom and I love you. Please do send more after this.